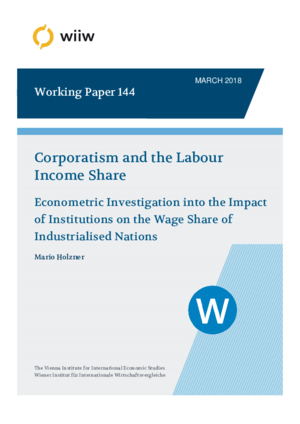 The aim of this paper is to evaluate the changing impact of corporatism – cooperation between business, labour and state interest groups – over the period 1960-2010 and across industrialised economies on the development of the share of labour in national income. Also due to data issues this relationship has not been extensively analysed in the literature so far. A new time-variant corporatism index developed by Jahn (2016) allows us to fill this gap. Using different panel data techniques, samples and control variables, our main results suggest that there is a robust non-linear relationship at work. While the linear effects of both corporatism and the public sector share are positive, the coefficient of the interaction term of these two institutional indicators is negative and hence indicates a negative slope for countries with both a high level of corporatism and a large government share in GDP in explaining the change as well as the level of the adjusted wage share in the long run. To a certain extent the two institutions can be seen as substitutes. In countries where the role of the state has been reduced, the existence of a more centralised wage bargaining system has limited the extent of the fall in the share of labour in national income. In countries with less prevalent collective bargaining systems, a similar effect can be achieved by higher government spending. We therefore argue for a stronger role for centralised wage bargaining in economic policy-making, especially in countries where the share of government spending in GDP is low.